What are the benefits of using GPS tracking? Whether you operate a fleet of rental cars, manage field service staff, optimise routes or oversee high-security transports: GPS tracking enables you to always locate the position of every vehicle in your fleet. This way, you can always keep an eye on your vehicles and cargo. Why should you employ the Fleet Tracking API by PTV xServer? The PTV xServer Fleet Tracking API is a software developer component, available as a cloud-based web service or an on-premise solution. Due to its standardised interface, the component can be easily integrated into an existing software architecture. Vehicle trackers transfer the GPS locations to a central system at regular intervals, which then displays them on a digital map. In effect, this means that dispatchers and fleet managers have the data they need, when they need it. This increased level of transparency facilitates the identification of inefficiencies and a more efficient fleet use. The Fleet Tracking API enables you to configure tracking profiles based on your needs. You would like to start working with the API immediately without making any modifications? No problem. We offer several pre-defined standard profiles, including adapted profiles for dense or sparse signals, that are carefully designed to fit most standard use cases as an out-of-the-box-feature. 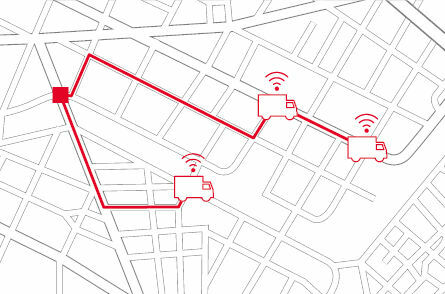 The Fleet Tracking API offers different tracking modes: You can choose to display single GPS points or the vehicles’ whole track history. When displaying full vehicle tracks, you have the option to also show driving direction and speed.